Architect of the New York Times bestseller “1632” that became a series of novels, anthologies, fan fiction, and online magazine. JMW: Hello, this is Jean Marie Ward for BuzzyMag.com. With me today is Eric Flint, the New York Times bestselling author of over 50 novels and the creator of the ever expanding 1632 Universe. Welcome, Eric. When you sat down to write the proposal for 1632, what made you think it would be a good idea to transplant West Virginia miners into the Germany of the Thirty Years War? Eric Flint: Well, what I wanted to use the novel for…novels should work on several levels. One of them is just entertainment. 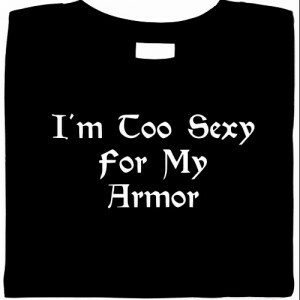 And I write action-adventure novels. So I wanted something in a setting that would allow me to do that which the Thirty Years War was certainly good for. Thirty Years War was kind of sheer chaos that was probably, most historians would agree, the most destructive war Europe ever went through, worse than any of the two world wars, especially in terms of its impact on Central Europe, which is centered on Germany but involves other countries around what’s today the Czech Republic, other parts. At the time, that was really the center of Europe. And that was true politically, as well as culturally. Through a mysterious ancient alien civilization the residents of Grantville, West Virginia are thrown back in time to 1631 Germany in the middle of the 30 Years War. On top of coping with the shock of being displaced in time and location, the people of Grantville must overcome the surrounding raging war, language barriers, and numerous social and political issues, including class conflict, witchcraft, feminism, the reformation and the counter-reformation, among many other factors. The image people have of Germany is a Germany that was created out of the Thirty Years War and the outcome of it. But the Germany prior to the early years of the Thirty Years War is a very, very different place. It was very dynamic. It was quite democratic in many respects. It was the intellectual center of Europe and it was hammered flat by the Thirty Years War. It’s estimated that something like 25% of the population was killed in the course of that war. At the same time it was an utterly chaotic war. It’s one of those wars that there is in the entire United States, one re-enactor group, whereas the Civil War will have hundreds. It’s because if you ever looked at the Thirty Years War drawn on a map, it just looks like a bowl of spaghetti. It was just a bunch of armies colliding with each other and there’s no clear rhyme or reason to it. On the surface, it was a religious war between Catholics and Protestants, but what laid beneath that were the dynastic conflicts of the different powerful dynasties of Europe which are often using religion as a way of doing it. And I wanted to plant right in the middle of that complete mess, and the book starts right in the middle, literally halfway through, a small American town. And I picked a coal mining town, for several reasons, in Northern West Virginia. One is that I’d lived there so I knew the area. I knew the people. The second is I wanted the trade union, which is, in this case, United Mine Workers, to be a central and important part of the story because that almost never happens in modern, certainly in science fiction. And what I wanted to use the novel for was to depict what I think are important features of democracy and egalitarianism that people today tend to take for granted. They don’t tend to think much about it. But I wanted to show how that would unfold in this utterly chaotic situation. And the final factor is that the world of Europe in the early 17th century, this is not a medieval world. We have entered the modern era. It’s usually called the early modern era. Contemporaries alive at the time were Galileo, Rene Descartes. I mean, this was…all of the various ideas, politically and in many ways scientifically, that the Americans would bring with them in this time travel, were already actually there. It’s just nobody ever put them together and showed that it actually would work. So you had…it’s an era, it’s called the Age of Absolutism, which is kind of ironic because it had revolutions happening in it constantly all the way through it. So it just seemed like the perfect period to do it in, rather than one where you had things settled more and it was more straightforward. There’s a lot of military action in the series. That’s not really what it’s about. JMW: You touched on something when you spoke about the union, United Mine Workers Union. One of the threads in your fiction that seems to be very important is the sense of community and that extends in a weird way because you invited other writers to play in this universe. How did that happen? What made you think it would be a good thing to create a community of writers around the concept of 1632? The new Confederated Principalities of Europe-an alliance between Gustavus, king of Sweden, and the West Virginia town, now called The United States of Europe, can rely only on American technology to save the CPE from Cardinal Richelieu’s (of France) threat of destruction. Eric Flint: Here’s how the series emerged. To begin with, it didn’t start as a series. It just started as one novel, 1632, which when I planned it and plotted it and wrote it, I simply intended to be a standalone novel. I did not have any plans to turn it into a series. And it works quite well as a standalone novel. What happened was, in the course of writing it, because of all the different things you have to cover in that book, I couldn’t possibly do the research needed to find out everything I need to find out. And when I discussed that with my publisher, it was Jim Baen at the time, he was still alive then, what we decided to do was create in Baen Books website a conference, a discussionary, devoted to this novel. And we called it 1632 Tech. And what I did was post questions to people, because a lot of fans actually knew things that I didn’t know, they could answer. And what I also started doing was posting the chapters of the novel as I wrote them to get the feedback from the fans. So from the very beginning, there was a tremendous amount of fan involvement in writing the novel. I wrote it, but I was getting constant input. People saying that, not so much of the dramatic aspects of it, I controlled that, but things like this technically won’t work or this will or why didn’t you think of this or whatever. By the time the novel was finished, it already had a fan base around it which is part of what helped it be so successful was coming right out of the gate. And I’m not sure exactly where it started, but fans themselves started writing stories in it. And I’ve forgotten the sequence. I’d have to go and look. 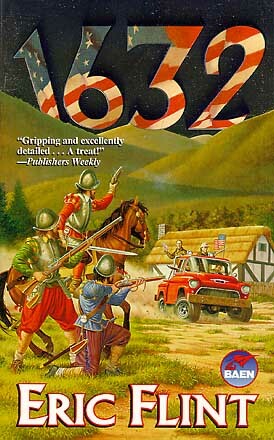 I can’t remember if the next novel series is 1633 . I can’t remember if that came next or if we did the first anthology next. Eric Flint: And the prospect, it’s not so much the money. Its that it was at a point in my life that where, partly because I wanted to, but also partly because I have a back problem that’s been developing for years from the kind of work I did where I really…if didn’t get out and do the kind of work I was doing, I was going to have to have surgery for it. And I didn’t want that. So I decided this would be the way I could start writing full time if I did this. But what I was concerned about, you have to be careful of series. If a series…a series can’t just be a series adventure because that gets stale very quickly. There has to be some overarching point to it. And all the other series I’ve worked in have an endpoint. In the case of Belisarius series, which I did with David Drake, those are all finished. I’m working on two or three other series that aren’t finished yet, but I know where they’re going. I’m not going to tell you but I know where they’re at. A collection of short stories that fill in the gaps between Eric Flint’s 1633 and 1634. All authors create different plot lines stemming from the same milieu. Some notable authors include Davd Weber (Author), Mercedes Lackey (Author), K. D. Wentworth (Author), Dave Freer (Author), S. L. Viehl (Author), Eric Flint (Editor). There would be no ending to this, just by the nature of it. It’s just a completely sprawling story that would just go wherever it went. And I was concerned that it not get stale, which is what the great risk you run with the long running series. And I thought that if I brought in other writers and we made this a kind of collective project, which I control overall, but there’s a lot of input from a lot of other writers, that would help keep breaking things up. You’d have fresh voices. It just wouldn’t get stale. That was the idea behind it. So with the first anthology of the Ring of Fire , we commissioned established authors to write half the stories. And we opened the other half of the anthology to submissions from fans. We had a special way they had to submit. They had to do it through Baen’s website rather than directly to me. So that’s what happened. We set up the magazine. It was successful. I paid him back fairly quickly. And starting in May of 2007, we turned it into a fully professional magazine. It’s now coming out with a 67th issue, pay professional rates. It comes out every two months. It’s made a profit for 10 years now which speaks to how deep the fan base is because there people who are really, really engrossed in this. As of right now, the editor of the magazine, Walt Boyce, Walt told me at Worldcon two weeks ago, that as of right now, 159 people have written something in the 1632 series, ranging from co-author novels to one story to groups of stories. We’re also starting to produce volumes of stories or novels written by people that I’m not either an author or co-author. There’s four of them that will come out. The fourth one’s coming out in December and those seem to be doing well. So it’s become this great big shared universe. There’s never really been anything like it in the history of science fiction, as far as I know of any other genre on this scale. 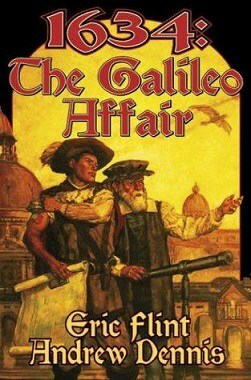 Simultaneously at war with England, France, Spain, Denmark, Austria and various other communities, a group of Americans establish an embassy in Venice hoping to build a trade relationship with the Ottoman Empire, make friends throughout Italy, but most importantly to deal with issues within the Catholic Church. JMW: It is enormous and it is so fascinating considering how many writers do not like fans “interfering” in their universe. How positive it has been for both you and for the fans. 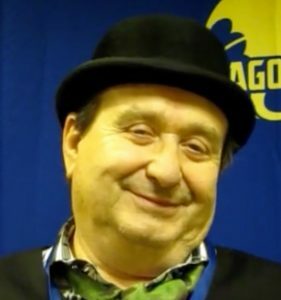 Eric Flint: Well, the other thing it does is it actually, a lot of what…Okay I think a lot of authors worry too much in general about a lot of things, which we’ll get into I think later in another subject. But there’re two things that tend to worry authors about fan fiction. One is that the fans are going to skew the original thing that they had in mind. The other is that there could get to be legal problems because a fan could accuse them of stealing the story or whatever. What I’ve essentially done is organize the fan fiction so that it’s really no longer fan fiction. So as far as I know, nobody writes fan fiction in the 1632 series except in the established, call it legitimate framework, if you will, because I provided it. And it’s not just me. It’s dozens and dozens of people involved in this by now. A lot of this runs itself. I just drop in and see how things are going, or if there’s an issue, I’ll come and sometimes [inaudible 00:12:28] I have to settle an issue. But basically, in one sense, the 1632 series has no fan fiction because everybody who wants to write it is welcome to come and take a crack at it and a number of them do wind up getting published professionally. And in the case of some, they wind up being novelists and its worked out very, very well. Now I will say one thing. I don’t think you could use this same approach in every kind of series because part of the advantage I have is that the series is set in an established historical framework, the 1630’s. And it’s based on an established technology which is whatever a small town in the year 2000 could have had in it. And those are objective. I don’t create them. So people have objective things they can look at in terms of figuring out a story whereas you can try to set something like this in a completely fictitious universe. It’d probably be pretty hard because the author would have to decide everything and that would possibly get overwhelming pretty quickly. 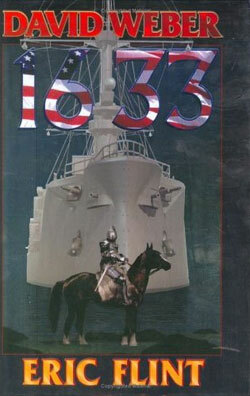 Eric Flint: Right now I am finishing the next novel of 1632 series, it’s called 1636, The Ottoman Onslaught. This is a solo novel. I’m the only author on this one. It’s coming out in January so I am just…I have like two chapters to go. I’ll have it turned into my publisher by the end of…I would hope to have it turned in by now but I didn’t quite finish. So that’s what I’m doing now. 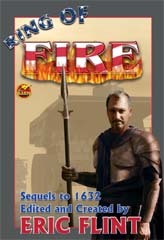 Following that there, I have to do some work on the next 1632 series novels coming out in April. It’s called 1636, Mission to the Mughals. I have to do some work on that. I’m going to write some of the chapters, re-write some stuff and so forth. And then after that, it would take too long to explain because it’s a lot of different projects I got to wrap up. JMW: You’re a busy man. Eric Flint: Yeah, I have plenty of work. Eric Flint: No, no, I think we’ve done fine, thanks. JMW: Thank you so much, Eric and thank you for BuzzyMag.com.